As winter tightens its grip on the islands, we are confounded by the constant approach of frontal systems that thwart our hopes for easy soaring. While the days grow shorter, our windows of opportunity for airtime grow even smaller, and we have to invest more time driving and hiking for less time in the air. But these winter windows often reward us with the most challenging and interesting flights, often over the least flown corners of the island. Yesterday, in the light veering northwesterly flow ahead of a rapidly approaching cold front, four of us leaped through a window of fantastic cross country adventure at our farthest and most mysterious outpost: Makua. Our world famous itinerant flying friends Cade and Becca are back with us after a long absence, and they are staying with Jorge while they’re here for a couple weeks. The three of them were interested in joining me for a day at Makua, which had looked pretty likely all week, although as the day dawned the forecast was not quite as promising. But it still seemed possible, and once you start thinking about going out there, it’s hard not to follow through. And maybe that’s a good thing. We still don’t really know how often that place is working, because we hardly ever give it a chance. I suspect it might work on any light wind sea breeze day. It’s a long drive out there, and we had plenty of time to examine the sky for cloud development, and the tell tales for wind conditions. It seemed like it was already overdeveloping, and it seemed very strong and west at Nanakuli. But we’d come this far, and we weren’t going to turn back now. When we got close we could see that there was almost no airflow at all, amazingly, and the clouds weren’t developing too quickly after all. The adventure almost ended before it began. There are two fresh signs posted at the trailhead of the Ohikilolo trail, which shares the ridge we use for launching. The signs say: US Government Property, Keep Out. I texted my friends at the HTMC, and they suggested it might be related to problems between hikers and one of the private landowners along the higher sections of the trail. But there were no signs posted farther along the road, where we typically like to start hiking. So we parked farther along, and hoped for the best. The breeze at the shoreline felt almost too light, and we waited a while down below for any sign of filling in. After a half hour or so it seemed to be picking up slightly, so we figured it was worth hiking. The little valley is greener and more overgrown than I’ve ever seen it, and we hiked through head high grass and dense haole koa, stumbling over rocks hidden in the grass. There is absolutely no sign of any trail anywhere in the launch bowl. But nevertheless we blazed impromptu paths up to launch, maybe 500 feet above the road, in about 15 minutes, and the cycles felt very promising there. Cade launched Jorge’s extra XC wing, the trusty old R10. Jorge took off next, followed by me and then Becca. We scratched around above the launch ridge and slowly benched up to the cave ridge, but we weren’t finding much up there. The flow was light and seemed to be hitting the ridge in the worst direction, right up the spine. We bumbled around playing bumper cars for a long time at the nose of the cave ridge, around 1,000 feet. I thought for sure we were cursed to stay at this height, in some high pressure hell, tormented by hopes of climbing out but never managing it. We’ve had a few days like that out there before. Then Cade got just enough higher to dive along the ridge line into the back. I waited to see him flushed horribly down on one side or the other, but instead he got yanked to the heavens in one massive rush of lift. Oh boy. So that’s how you do it. After a few attempts Jorge and I managed to sort of follow his lead, and a bit later Becca joined us. The thermals were super strong and horribly broken up, just really mean and grumpy. We’d make a few turns and then go weightless. Or we’d try to crank a turn in the strongest part and just suddenly find nothing to grab. There was no obvious drift direction in any give climb. Jorge later said he'd seen my wing surging all over the place as I was climbing and he knew his looked the same. But finally Cade was at cloud base and I was reasonably high as well, 2,600 feet or a little more. Before heading downwind toward Nanakuli I wanted to first try and make it to the Yokohama side. I thought I had enough and blazed a trail. I got an okay line going across the valley, but I was getting low as I approached the other side. I gave the shoulder a wide berth, assuming the northwest flow would try to shut me down, and that the good lift would be right around the corner. I pulled in low, waiting for that good lift to save me. And there was nothing. The grass on the ridge was still as the grave. And I was barely high enough to make Yokohama beach. If I continued to scratch I’d sink too low and have to land on the Air Force grounds behind the guard shack. So of course I continued to scratch. I skimmed the low slope toward the first switchback in the road. It felt like I could just land on the road. But I got little scraps of lift, enough to make me think it was worth continuing. I kept skimming the slope past the road, toward the point, until the air felt strange and dead, then turned back and rode the bubbles of lift slowly higher and higher. This was going to work. I started to breathe. Meanwhile Jorge and Cade had benched up higher before crossing and so they arrived higher, skipping over my sad little struggle. Down there I felt like I had just pulled off the most unlikely low save ever. Then I saw Becca pulling into sight, even lower than I’d arrived. Oh, this wasn’t going to be good. She bumbled around super low, like right over the guard shack. Then Jorge helpfully says over the radio: by the way Becca, you shouldn’t land on those slopes because it’s Air Force property. I think was almost setting up a landing! But she stuck with it and slowly wafted up my way, as I continued my scratching up the switchbacks of the road. Meanwhile Cade and Jorge were getting above the ridge line, and Cade was seriously considering heading over the back to land at the drop zone. I wasn't interested in that kind of mission! Once I was high enough I got the heck out of there and blazed back to Makua. By this time I’d finally figured out why the air was so mean and trashy this whole time. We were in the lee. At some point it had turned more north and the whole side of the island was slightly leeside. I used to think it wasn’t possible to fly in the lee. But now I know it’s possible, especially on lighter days, but it’s just not always super fun. So far this flight was incredibly challenging. At this point I was ready to relax and land. Then Jorge followed me back and said: Okay! Now let’s go to Nanakuli! Cade had thought better of his DZ mission and followed soon after. So really, now we're going to Nanakuli?? I forced myself to keep my head in the game, and repeated the crazy lee side climb I’d managed on the first round. This time was a bit easier because I wasn’t surprised by the ferocity of the lift. I was almost relaxed and resigned to the roughness. I was breathing normally the whole time. I guess this is good for bump tolerance if nothing else! I got somewhere above two grand, and it felt like enough to cross the first valley. I headed across and came in easily on the next shoulder, and started to map out the lift. It was everywhere! Wow, this was going to be easy. I was soon up above two grand over the near shoulder of Makaha. Nanakuli looked close! But I wasn’t penetrating very well while facing the wind, facing toward Makua. Then Ray called me on the phone. He’d been working at Yokohama and watching us enviously. He said the clouds had started to drift offshore, and there were cats paws and horrible gusts on the beach over there. Sure enough, I could see those rotor balls now that I was looking for them. Huge ones, spinning and slithering across the water toward Makua. Meanwhile Jorge was climbing at Makua with Cade and Becca, and he warned them against going too high or deep because he was noticing an increase in the wind. So things were going south fast. Or maybe it was north. Anyway, the window seemed to be closing fast. 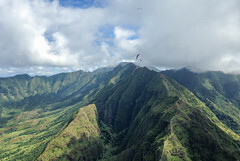 We all decided to play it safe and land right away, at the park below that near shoulder of Makaha where I’d been parked waiting for the others. It was quite strong down there but the landings were uneventful. Cade cleverly hitched a ride with a nice Canadian family and shuttled us back. We debriefed over cold beverages at an awesome little Puerto Rican place in Waianae that Jorge had been to before, Coquito’s. Try the Mofocombo or whatever it’s called. Yummy! After landing I was super relieved and really happy to have made that flight work, even though it hadn’t always been a pleasant ride. I really didn’t think I would have tried any of that stuff if I hadn’t been flying with those particular guys charging as hard as they were. I said I thought it was the worst flight I’d ever loved, or the best flight I’d ever hated, or something like that. Hence the title of this story. Of course after a couple of cold beverages there were only happy memories remaining. Definitely just the plain old best flight ever! Great write up, felt like I was there. Wish I was. I saved this story for coffee today which ends up being a double bonus. I passed out at the Colby Compound, now with a cup of delicious coffee I am reading this spanking tale. Oh, Sidehill is not up yet, he drowned his sorrows in a few gallons of red, I may have to read it to him a little later. Thanks for the read and the coffee.